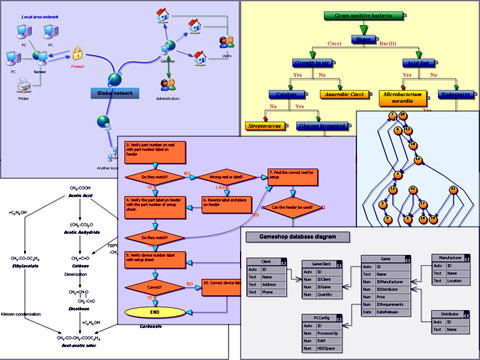 DiagramLite can be used in Silverlight applications to create and present workflow, flowchart and process diagrams, database entity-relationship diagrams, organizational, hierarchy and relationship charts, graphs and trees. Its basic types of items - shapes, containers, and links - can be grouped and attached one to another and combined in complex structures. The control provides many predefined node shapes and allows custom-designed ones. A Silverlight control for drawing workflow, network and organizational diagrams. ...... The Overview control provides scaled down view of the diagram that lets the user see the whole diagram and navigate to a different location. The Ruler control can be used to measure and align nodes. The NodeListView control can be used to create palettes of objects that are cloned when the user drags them onto the diagram. There are many more useful features coming out of the box, such as automatic layout algorithms, link routing, graph path-finding and printing. Other features include an alignment grid, scrolling and zooming, locking, z-order, support for styling. The control's programming model comprises more than 500 methods, properties, and events. Full source code is available for purchase too, giving you unlimited ability to customize every aspect of the API. Qweas is providing links to DiagramLite 2.3 as a courtesy, and makes no representations regarding DiagramLite or any other applications or any information related thereto. Any questions, complaints or claims regarding this application DiagramLite 2.3 must be directed to the appropriate software vendor. You may click the publisher link of DiagramLite on the top of this page to get more details about the vendor.